This impressively large glass bead (28mm in diam.) was found in 2010 at an excavation near Upper Hawling, Gloucestershire. The dark-coloured (appearing black) opaque glass ground is set with six ‘eyes’ of appearing black glass surrounded by opaque yellow rings. Further decoration is provided by zig-zag trails of opaque grey/white and opaque turquoise coloured glass applied after the white.The overall effect of the trails produces a diagonal cross between each setting and, viewed from the upper and lower faces, a six pointed star. 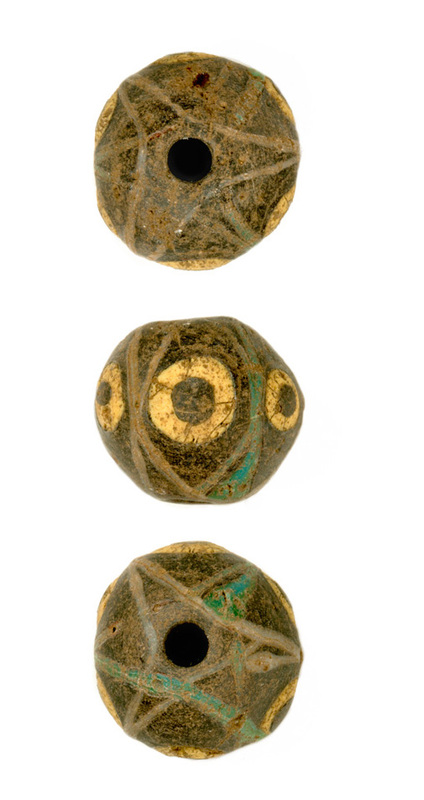 The small number of beads of this type which are known all come from sites in the west of England, mainly from the Gloucestershire Cotswolds. They are a distinctively Late Roman or early post-Roman type, dating probably to the very late 4th or early 5th centuries AD. As such they are a rare example of a class of artefact specific to this important period of transition. This example came from a pit which also contained coins of the 360s-370s AD, fragments of metal, glass and pottery vessels, a lead weight and most unusually, a bronze pin of a type which was at least 500 years old when it was deposited. Some of the items from the pit appeared to have been deliberately broken and it is thought likely that this is a ‘special’ deposit associated with a ritual act. With many thanks to Hilary Cool for the information about this lovely find.